Roger Langridge has made quite a name for himself with various anthropomorphic comics at Boom! Studios, including The Muppet Show, Snarked, and the recent Musical Monsters of Turkey Hollow. 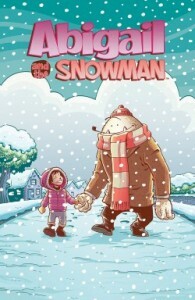 Well now he’s back with another creator-owned miniseries, Abigail and the Snowman. According to an article over at Comic Book Resources, this new series “…focuses on a girl moving to a new town and befriending a yeti named Claude. Unfortunately for the new friends, Claude happens to be an escapee from a nearby facility that wants him back. To keep her new pal safe, Abigail and Claude go on a journey to find his home. ” Look for the first full-color issue to hit stores in the middle of December.